AFSCME announced today that they had reached a tentative agreement with UC and that the strike planned for next week has been called off. As you will see, this tentative agreement is the result of a long series of bargaining sessions and will be voted on soon by the AFSCME membership. Negotiations between AFSCME and UC about the contract for Patient Care Technical Workers will continue next week. I have copied the announcement below. 3299 represented UC workers has been cancelled. 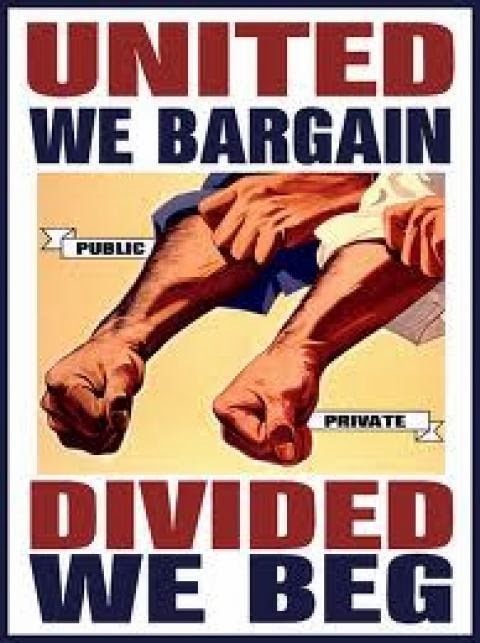 bargaining with UC, with more sessions scheduled for later this week. with Service Workers next week. within reach, and a new period of cooperation can begin." of our core demands on wages, staffing and job security. Wages: 13.5% in ATBs; 2% steps in 2014, 2015, 2016; plus $200 signing bonus. Staffing: New Protections on Contracting Out, Seniority and Layoffs. Thank you for your continued strength and resolve. David Dayen has a provocative article at the New Republic on the effects of student debt on household formation. Drawing on a range of studies, Dayen is able to show that the recent skyrocketing of student debt, combined with the continued depressed state of the economy and the job market, has led young people to put off the traditional American steps towards household formation and generational independence--particularly purchasing of housing. Dayan makes clear what others have pointed out, that the rise in student debt is not only dismantling the future of recent and current students but is also producing an ongoing drag on the larger economy that will only lengthen the country's economic weakness. Actually, things are worse than Dayen suggests. Dayen draws particularly on two reports produced by the New York Fed (or related economists). The first report reminds us that not only did outstanding student debt as "reported on credit reports" pass the one trillion dollar mark in 2013 but that it increased by $114 billion in that year. Put in perspective, the increase in debt in 2013 alone was more than half the total student debt in 2000. The second report sharpens the issue however. It makes clear that in recent years a significant shift in debtors' practices has taken place. Before the recession, individuals with student debt were more likely to enter the housing and automobile debt markets (due to their greater confidence in their prospects) than were those who did not have student loans (primarily I think because they had not attended college). But since 2008 that has reversed itself. Individuals with student debt are now less likely than those without student debt to have longer-term credit investments. Now no one knows, exactly why this is. It is likely a combination of factors. As Dayen and the Fed researchers note, it is related to the collapsed job market, to the fact that it is harder for young people to get credit with tightened restrictions on individual borrowing (I guess that was instead of actually regulating Wall Street and the Banks) and because the increase in the size of student debt makes people less willing to take on other debt (quite sensibly). But as with unemployment, underemployment, and lowered wages more generally, there are ripple effects that serve not only to hold back student debtors but the economy as a whole. Yet Dayen does not draw out the full implications of the data. As do many, he points to the long-term rise in higher education tuition, drawing on data provided by Bloomberg. In so doing, he accepts the undifferentiated chronology contained in the claim that tuition has risen by more than 500% since 1985 and thereby throws us back on the neo-liberal emphasis on the "cost-disease." But if you look more closely at Bloomberg's data you will see that nearly 60% of that growth has occurred since the early 2000s--in other words since the beginning of the heyday of state disinvestment in higher education. Insofar as the dramatic increase in student debt is helping to undermine the future of the economy, the internal privatization of public higher education (the shift of burden from public investment to private debt) has played an important role. Oh, and just for the record: UC has not done that great a job on this issue despite its claims for its financial aid programs. According to its own 2013 Accountability Report the average debt for UC student borrowers was just under $20,000. According to Fed researchers the average student debt was just over $20,000. Out here in California, our Democrat-controlled state government has been busy repainting higher ed austerity as abundance. Last week's Legislative Analyst's Office reports form an interesting case in point. Appearing to be a rejection of Democrat Gov. Jerry Brown's college funding scheme, they assert the full adequacy of the current public funding base and call for inflation-capped funding augmentations that will come in large part from tuition increases. The LAO does want higher ed segments to get a budget keyed to workload, which is an improvement on the governor's more Platonic approach to university funding. But the LAO folds in UC's unfunded students, accepts the current cost share between the general fund and student tuition, and sets up figures that will be impervious to current senior managemnt arguments for better funding. Meanwhile as Michael noted, the faculty at the University of Illinois-Chicago are going on strike today. Reading through an explanation for the strike, I found at least one argument that would work better with state government that what most public universities are doing right now. What are we doing now? We are in general broadly hinting that current state funding isn't enough. For example, in an interview with UC's President Janet Napolitano, the Chronicle of Higher Education's Eric Kelderman noted that California is on the "vanguard" of economic and demographic shifts towards low-income and first-generation students, and asked whether UC's post-cuts funding was enough to meet the needs of the state in the future. Pres. Napolitano replied, "No. We have to be talking to the state about increases--increases in the right way" (3:13). Does this mean more than the 5 percent partial restoration of prior cuts that Gov. Brown has said is the upper bound? Pres. Napolitano didn't say. UC has previously calculated that it needs annual 12 percent state restorations (see previous posts like "Addressing the Austerity Lock-In at Public Universities," Jan. 2013) or "The Old State Funding Model is Dead: What Will Replace It?, Nov. 2013). The Governor and legislative leaders have assured everyone that this will never happen. The current track is that UC will have climbed back to the same state general fund income in 2015-16 that it had ten years before, uncorrected for inflation and enrollment growth. 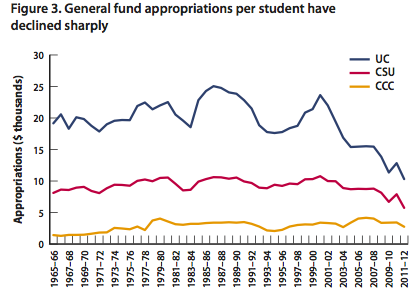 But why should public universities get much faster state funding growth, exactly? What do public universities need more money to do? President Napolitano mentioned maintaining and building large capital facilities, keeping low tuition, and planning future enrollment growth. (She did not mention faculty salaries and pension costs, for which I am very grateful.) How do these needs play with state government? Enter on cue the LAO report, "Analysis of the Higher Education Budget," which is not to be confused with the no less attractively titled "A Review of State Budgetary Practices for UC and CSU" referenced by Dan Mitchell at the UCLA FA Blog. The LAO shows UC core funding as better than ever (Figure 1), up 10 percent over two years in a soft economy and in the midst of a tuition freeze. The crucial calculation from the state point of view comes in Figure 2, below. As you read it, bear in mind that the Georgetown University Center on Education and the Workforce recently calculated that the country's 468 "most selective" universities spend on average $13,400 per student per year on instruction (Part 2). The LAO tells us that even after massive state cuts, UC spends nearly $10,000 more per student than the "most selective" college average. It also shows UC spending twice what CSU can spend per student, and four times what the community colleges spend. I am not saying these numbers are accurate: they no doubt greatly overstate how much money winds up in the classroom. But as presented, the figures destroy any UC claim to inadequate funding. They also make a tacit case for giving new state money to CSU and CCC, since entry-level learners need more instructional resources if they are going to achieve the national goal of increased degree completion. (The Georgetown report, Separate and Unequal, is a searing, unforgettable analysis of the economic and racial consequences of underfunding). The first element of a better public research university response would be that much of that money goes to support the core mission of basic research: in UC's case, that we are after all a research university. On this point, President Napolitano's major innovation has been the new slogan, "We teach for California. We research for the world." This has played well in the state: you may have noted the Sacramento Bee's enthusiasm for assurances that, in spite of a major shift towards the admission of non-resident students, UC is still in the business of educating Californians. But the second half of the statement implies that UC research should be supported not by the state but by rest of the world, since it's the world that mainly benefits. This isn't true, and in fact the opposite of the new slogan is just as true: We increasingly teach the world, thanks to the pursuit of non-resident tuition, and we research for California--in ethnic studies and literary history as much as in agriculture and electrical engineering. Our research is also tied to our instruction, and is not a separate activity in which undergraduates have no role to play. 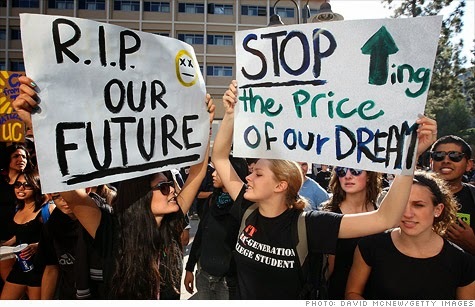 Were they separate, UC students should save half of their tuition by going to Cal State. We've often criticized insufficient support for research costs on this blog (e.g. Michael last month)--and the lack of transparency about them. If the state doesn't understand the costs of research, it has no reason to pay them. That is exactly what has been happening, as we can see clearly in a figure from a Public Policy Institute of California report that I discussed in 2012. The numbers are different from the LAOs because this figure excludes tuition revenue. The state has plainly decided to fund UC, the research university, more like Cal State, a comprehensive, teaching-oriented university. If the state doesn't need to help fund research, why shouldn't it cut per-student general funds to Cal State levels? To keep this convergence from continuing, UC needs to disaggregate and explain research costs. These can indeed be justified, and we need to do this as a large-scale collaborative project. UCOP will be formally required to present disaggregated expenses information to the state next year. While we are waiting for this to happen, we can also focus on instructional costs. And here, Chicago is more helpful than Sacramento. Only about a third of our students come from families making over $60,000, and many of our students are from immigrant families, live at home, hold full- or part-time jobs, and even have children of their own. . . . [T]he UIC faculty and the UIC administration are completely united on the fact that we don’t think that the way to solve [retention and related academic] problems is by getting “stronger” (which is to say, richer) students. In fact, when we put together a “Strategic Thinking Report” back in 2005, we explicitly said we’re not looking to recruit “better” students; we want to do a better job of educating the students we have. The main goal of UIC strategy, then, is to increase educational quality--which any reader of this blog has undoubtedly noticed has become a national movement. Profs. Davis and Michaels add, "The UIC faculty is committed to that mission. And the whole point of the strike is to help us fulfill it." Start with the retention problem. The biggest falling off is between the first and second years of college, so our administration is (rightly) concerned with the first year experience. What courses do first year students take? Who teaches those courses? Public universities need new revenues to give students full-time faculty who can be more devoted to feedback, follow-through, advising, and the other forms of face-to-face contact that have been repeatedly shown to improve persistence and learning. They can get them from tuition hikes, which then deters and/or indebts exactly the most vulnerable students that they are trying to help. Or they can get these revenues from the state--on the grounds that a major upgrade in student learning--on a mass scale--is a public good that defends the future. UIC and UC are research universities that operate in a state political environment in which the Cold War research funding deals are completely finished, and where tuition hikes can and should be capped by the basic facts that public college students are poorer and more diverse and more indebted (and arguably more interesting, worldly, and engaged) than ever. This means that we all have to make the teaching and the research case in interconnected ways and at the same time. I think we are up to this, and the UIC faculty are making arguments that can help us in California. 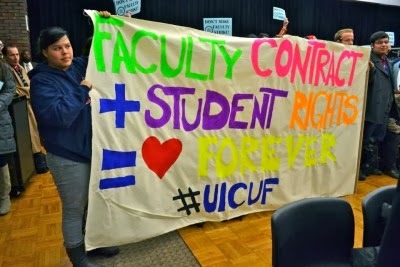 The Faculty at the University of Illinois at Chicago have gone on a two-day strike to protest wage compression (for both tenure-track and non-tenure-track faculty) and also to draw attention to misplaced spending priorities at the University. At UIC the median salary for tenure track faculty is $65,000 and the standard salary for non-tenure track faculty is $30,000 per year. The Union at UIC is pressing the administration to allow larger and more regular salary increases for both categories of faculty. Just at the tenure-track and non-tenure track faculty are standing together, the strikers are also demonstrating solidarity with their students. As Lenny Davis and Walter Benn Michaels note in a recent statement, UIC students tend to be poorer than their counterparts at related flagship campuses and face larger retention challenges. 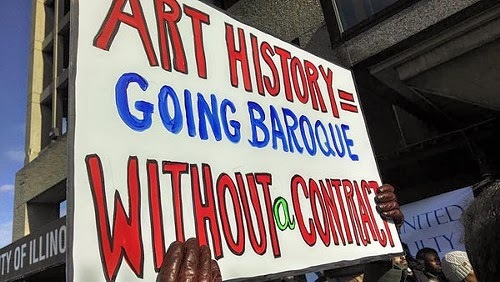 In order to improve their ability to stay in school students are required to take writing courses, writing courses are taught by lecturers and lecturers are not paid what is a sustainable wage (given the costs in Chicago). By striking for 2 days the faculty have also ensured that they do not penalize their students. You can get more information at the union's SITE. You can read an interview with the Union President here. And for more context of the strike in a longer perspective see here. FOR NEWS ON SECOND DAY see here. Let me try to set the stage for discussion of our announced topic, the cost of program mergers and closings. I first considered the topic closings when, three years ago, the immediate past president of the Mellon Foundation, Don Randel, asked me whether we should consider a grantmaking initiative in support of such traditional fields as German, Italian and Russian studies or specifically in support of teaching the German, Italian and Russian languages. The question arose in the wake of the 2010 MLA report on enrollments, which discussed long-term trends in the study of foreign languages essential to scholarship in the humanities. However, the impetus behind Don Randel's question was more particularly the foundation's concern with retrenchment in colleges and universities that were reacting to the Great Recession of 2008. The MLA report on enrollments barely reflected the moves toward retrenchment, if it did so at all. However, we had previously had occasion to discuss a June 2009 article by Scott Jaschik in IHE about troubles in the field of German, and early in 2010 we were already hearing about cuts in Title VI support of international studies and foreign language programs that Congress was contemplating. So the larger concern we proceeded to broach with people in various colleges and universities we work with was that the financial difficulties caused by the Great Recession of 2008 could have particularly severe effects on vulnerable academic programs or departments that were already plagued by relatively weak enrollments, a poor job market for Ph.D’s, sub-par resources for supporting a large corps of non-tenure-track language and writing instructors, and a great deal of facile public discourse about the need to connect undergraduate education to gainful employment. Over the next year or so, we came to the conclusion that it would not make sense to support those embattled traditional, commonly taught languages or other apparently imperiled humanities fields in the somewhat rarefied universe of institutions that Mellon serves. We undertook instead some discrete grantmaking related to areas studies and the less commonly taught languages. Since that moment three years ago, two additional factors—one general and one particular—have come into play. The general one is obviously the interest in online educational opportunities that extend far beyond the domain of for-profit institutions that offer career-oriented degrees. The new online thrust, focused on the design of online courses eligible for credit in non-profit institutions, further loosens the once largely unquestioned hold of traditional in-classroom delivery of instruction. The particular one, which is perhaps unique to Mellon’s liberal arts colleges program, stems from institutions seeking to join in collaborative arrangements for the teaching of Arabic; they can only afford to do it consortially, but at least they are trying to do it in response to strong student demand. This latter trend points toward a related factor—an incidence of program-creation that is greater than that of program-closing—that needs to be included in the context we are considering. All the factors I've noted--enrollment trends, the job market, the weak position of adjunct faculty, the shift of resources into professional programs, the growth of online instruction, and multi-institutional collaborations in Arabic language programs and often in Islamic Studies as well--contribute to a horizon toward which the topic of mergers and closings beckons, i.e., the effort pervading the whole of higher education to reduce costs by organizing the academic enterprise more efficiently or strategically. Now, given the structures that prevail in the stratified, marketized system of higher education that we have, which do limit the room to maneuver of the responsible administrations, it is not surprising that closing departments and programs and forcing mergers are frequently considered managerial options. I believe it is fair to say that the data we have on closings and mergers that have actually occurred over the past several decades is thin and that analytic work on the phenomenon is sorely needed. But with that caveat in place, given that the closings and mergers reported over the past five years are relatively spectacular because they turn out not to be all that numerous, and given that administrations do not seem to be rushing at every turn to pursue them, one can reasonably ask why they have not been used more frequently. At this juncture, the primary observation that I would make is that in classic institutions that would be in the upper quarter or third of the more than 4000 post-secondary institutions in the system, the most prominent effect of the department and program closings that have occurred in well established zones of their curricula has been to draw collective attention to the problems and risks we are facing. A closing or a merger typically results in serious intra-institutional discussions about what is at stake when operational changes are necessary and about how the integrity of an academic and scholarly mission can be preserved or undermined. So there have actually been benefits as well as costs, and one benefit of note has been the mobilization of programs at risk that need to renew and defend themselves. It’s not surprising that administrators hesitate to eliminate components of a curriculum and look for less visible means to make cuts. Can we nonetheless imagine a scenario that has not yet occurred in which the numbers of closings and mergers that dilute programs would escalate? Could there be a really damaging shakedown that would spread across hundreds of institutions? 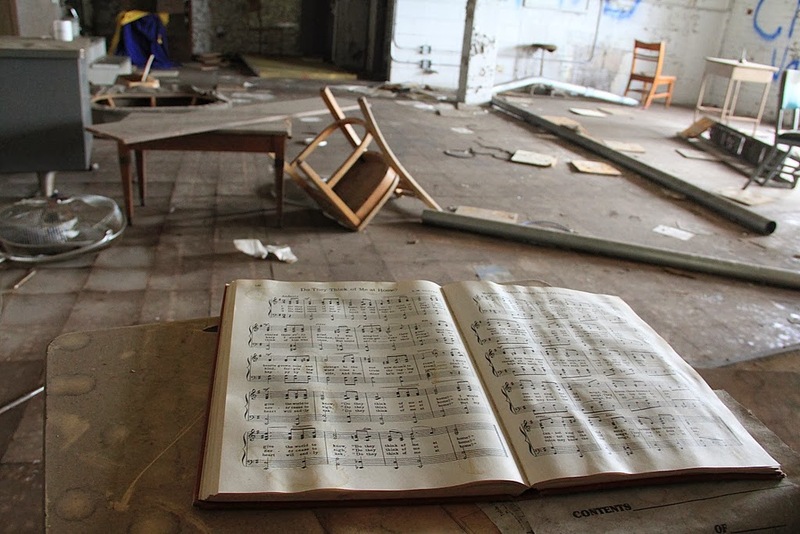 Such a cataclysm seems far less likely to me than a rather more common phenomenon, less dramatic than outright program closings, that is also far more widespread and harder to study than the shuttering of programs. The likelier scenario is what I would term shrinkage by attrition and reorganization, in which mergers--the folding of small departments or academic units into larger ones--would be a major device, but perhaps not the most significant one, which would be exemplified by the downsizing that occurs when faculty members retire and their positions are either eliminated or moved to another area of the academic enterprise. That process of resource reallocation is one that can occur with little fanfare. It is the natural result of the principle that allows the intra-institutional market, defined through the lenses of enrollment patterns or student demand, to dictate the ongoing reshaping of the academic structure (or perhaps one should say enterprise). My guess, which stems from a sense of the history and structure of the system, but which the data worshipers in our world would correctly say is not yet well supported, is that the cost of this subtle, incremental diminution of support for the language and literature, for the liberal arts and humanities, for education as a broad intellectual project is far greater than that of the visible closings and mergers we have witnessed up to now. (A broad perspective that resonates with mine is offered by Russell Berman in “The Real Language Crisis," Academe (September-October 2011.) It is important for us to be talking about how we can recognize and combat that larger and more nebulous trend even as we try to draw the appropriate lessons from such closings and mergers as have occurred. Can A Faculty Strike Break a Legislative Loop?